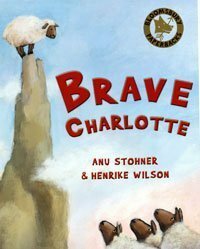 Charlotte is anything but the stereotypical sheep: rather than being one of the flock, she prefers climbing trees, swimming in streams, mountaineering and generally exploring, especially at night. So, when the shepherd breaks his leg, it is Charlotte, not Jack the long-in-the-tooth sheepdog, who volunteers to go for help. I’m not sure whether this longish story, first published in Germany, has lost something in translation, but it seems somewhat disjointed and lacking in sparkle and even the dramatic paintings, for me at any rate, failed to lift the story out of the ordinary.